The Syracuse-Wawasee Rotary Club members and Board recently donated $950 to the Beaman Home’s campaign to build a larger Emergency Shelter and Outreach Center on North Parker Street in Warsaw. 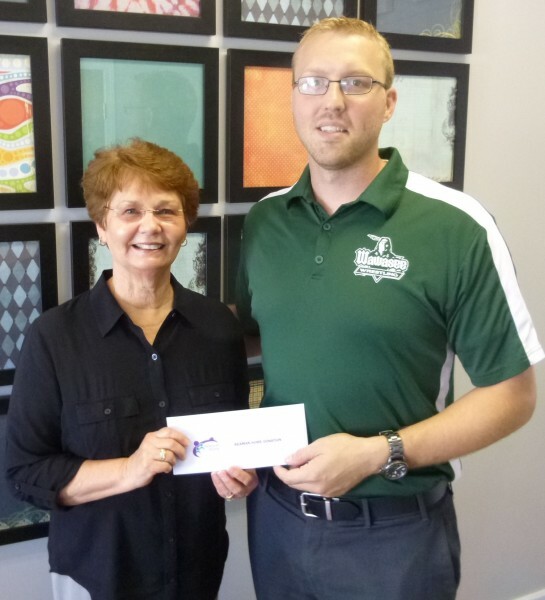 Club president, Dr. Erick Leffler, made the presentation to Beaman Home’s campaign chair, Sue Creighton. The club’s board had encouraged members to donate and matched funds collected at a recent meeting following a presentation by Beaman’s Executive Director, Tracie Hodson. Beaman Home is in the final stages of raising funds necessary to remodel and add a two-story additionto a vacant building the organization has purchased on North Parker Street. The Beaman Home’s newfacility will replace an aging home donated to them 30 years ago and will combine the organization’s Emergency Shelter and Outreach Center into one campus. Construction on the new campus is expected to begin late this year.